Planet-TECH Associates is a partner with The Boston Foundation Indicators Project in development of the Hub of Innovations Tool. The Boston Foundation is one of New England's most established foundations, and their Indicators Project is considered a national prototype for the communication of key municipal trends and data. The Hub of Innovations tool highlights initiatives that are exemplary and show promise for improving the quality of municipal life and commerce. Identifying innovations for the the Boston Foundation's Indicators Project. "This new tool is information-rich, visually compelling, and of great practical use to regional planners." "Planet-TECH Associates helped us to conceptualize and implement a prominent enhancement to our Indicators Project, the 'Boston: Hub of Innovation' tool...This new tool is information-rich, visually compelling, and of great practical use to regional planners." "The 'Boston: Hub of Innovation' tool helps us to better serve our community by providing insight into many cutting-edge programs…It helps the Boston Foundation to further distinguish its Indicators Project as an exemplary model of information dissemination on trends and innovations key to the well-being and competitiveness of municipalities." Innovations can be challenging to find and describe. It often necessitates a paradigm shift, especially when talking about the economic impact of advancing innovations. The Boston Foundation (TBF) approached Planet-TECH Associates to conceptualize and implement the 'innovations' section of its 2004 Boston Indicators Project, which spanned ten municipal sectors ranging from civic health to transportation. Since then, Planet-TECH has been a consistent partner with the The Boston Indicators Project, working on the Hub of Innovations tool for every update since. TBF's Boston Indicators Project is widely recognized as a national prototype to communicate key municipal trends. With assets approaching $700 million, the Boston Foundation is one of the largest community foundations in the United States. 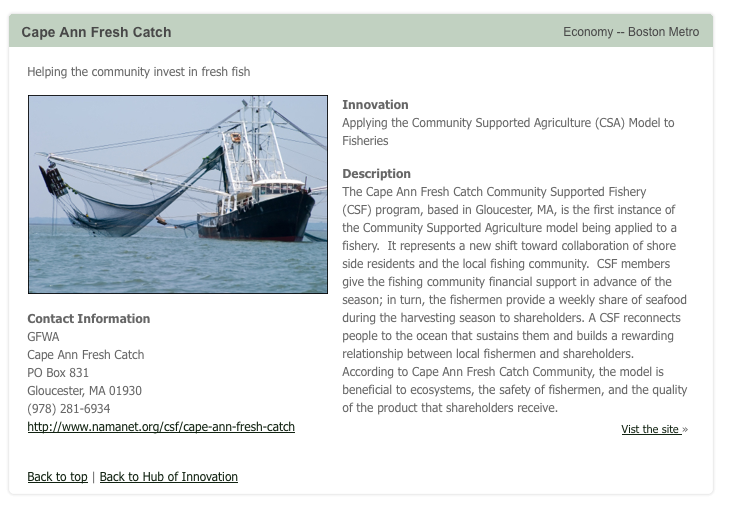 The Boston Foundation contracted Planet-TECH Associates to expand the breadth, utility and appeal of their 2004 update. The previous innovations report was limited in its scope and how it presented advancements that could bolster regional development. Identified sectors had no measure for comparison with exemplary innovations elsewhere, as projects were limited to only those that existed within Greater Boston. The handful of initiatives were presented as text-only narratives with separate category pages. There was no way to access them collectively and dig deeper. Planet-TECH Associates was instrumental in all creative and implementation aspects of The Hub of Innovations. It coined the name 'Hub of Innovation', devised the visualization, and did all the research and web updates. The result is a visually compelling and information-rich repository of innovations from around the world, germane to quality-of-life enhancements in cities such as Boston. The online report includes over one-hundred national and global innovative initiatives alongside local ones, enriching the quality and quantity of purposeful information. Everything is easily accessible by topic and region, and can be further explored by hyperlinks. TBF's 'Hub of Innovation' is now a persuasive tool of practical use for regional planners. Planet-TECH Associates provided vital services that enabled TBF to compellingly reposition Greater Boston as a nexus of innovation. As Charlotte Kahn, Director of the Boston Foundation Indicator Project explains, "the tool is of great practical use to regional planners." Planet-TECH's futurist ideologies empower municipalities, community foundations and private developers to anticipate what's ahead with economically and environmentally beneficial innovations.